What do you get when you take a tagine and give it a persian twist? 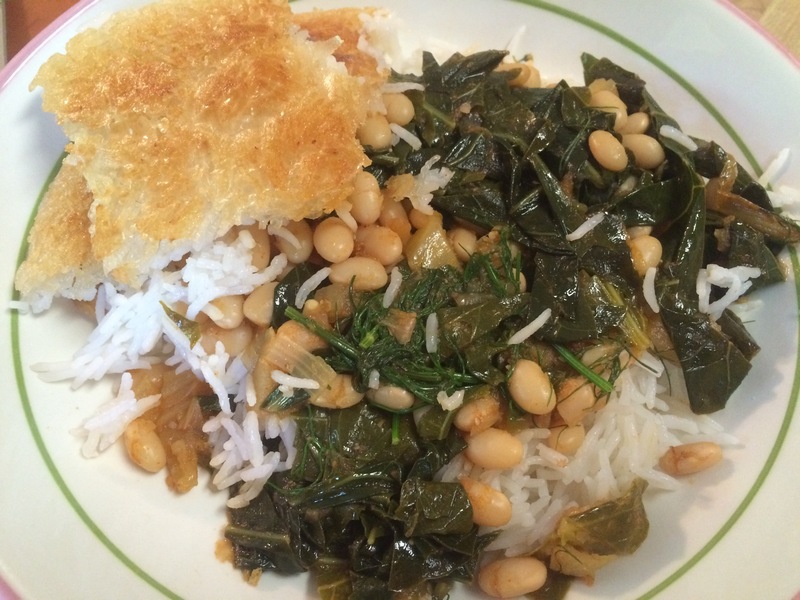 A khoresh that is both healthy and…extremely flavorful!! 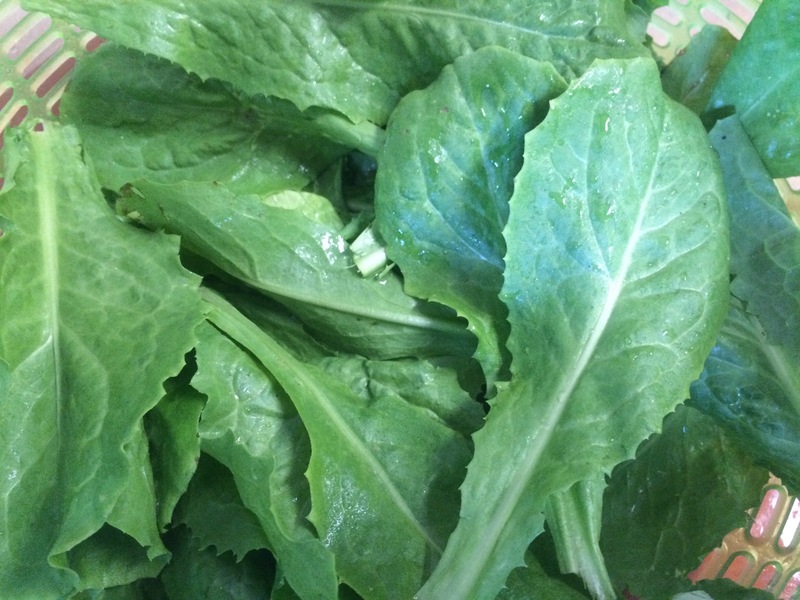 Collard greens are something I never tasted until I grew them in my garden a few years ago. I guess that is because they are often prepared with ham or bacon, foods we don’t eat. Most traditional preparations are not very healthy, so I have been on a search for vegetarian, healthy preparations. This was the best yet, we all loved it. And yes, it was even better the second day. Can you see the fennel fronds in the picture above? Don’t omit them, they are key to the bright flavor in the stew. The beautiful greens in here are collard greens from my garden. They survived the groundhog and are growing strong. Transfer drained beans to a large, heavy flameproof casserole or Dutch oven. Add 6 cups water, onion and crushed garlic cloves, and bring to a gentle boil over medium-high heat. Cover and reduce heat to low. Simmer 45 minutes. Using tongs, remove onion and garlic cloves and discard. Meanwhile, in a small skillet over medium-high heat, toast coriander and cumin seeds together just until they begin to release their aroma, 2 to 3 minutes. Transfer immediately to a spice mill and allow to cool for a few minutes, then grind. Heat oil over medium heat in a large heavy skillet and add chopped onion. Cook, stirring, until tender, about 5 minutes. Add minced garlic, diced fennel and a generous pinch of salt. Cook, stirring frequently, another 5 minutes, until fennel has softened slightly. Stir into beans. Add ground spices, paprika, 1 tsp salt, jalapeño and tomato paste and return to a simmer. Cover and simmer 30 minutes. Taste and adjust salt. Meanwhile, stem and wash collard greens. Cut leaves in half down the middle. Stack and roll up several leaves, and cut crosswise into 1/2-inch strips. It should be about 5 cups of greens. 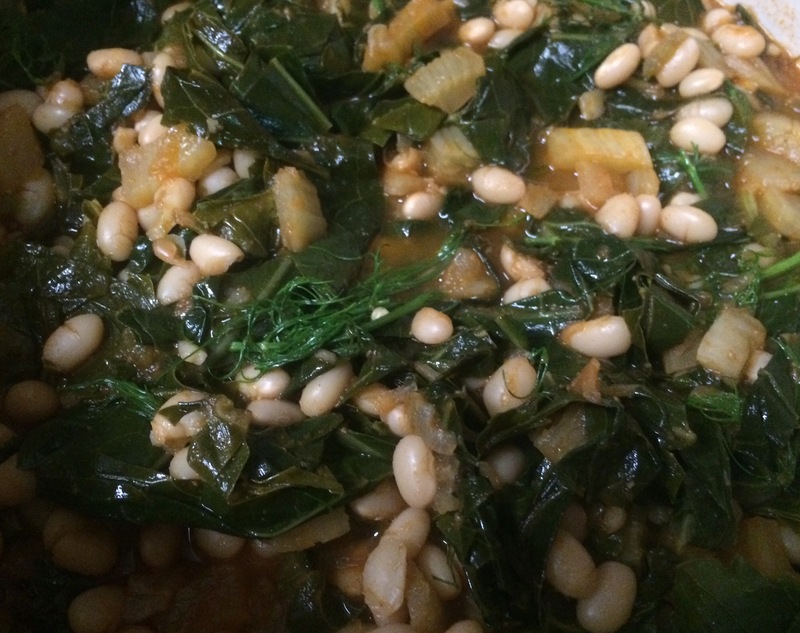 Add collard greens to beans and vegetables. Bring back to a simmer, cover and simmer 15 to 30 minutes, until greens and beans are tender. Stir in chopped fennel fronds and simmer another 5 minutes. Taste and adjust seasonings. Place the rice in wide soup bowls. Ladle the khoresh on top. Garnish with tah dig (crispy bottom of the rice), and serve. 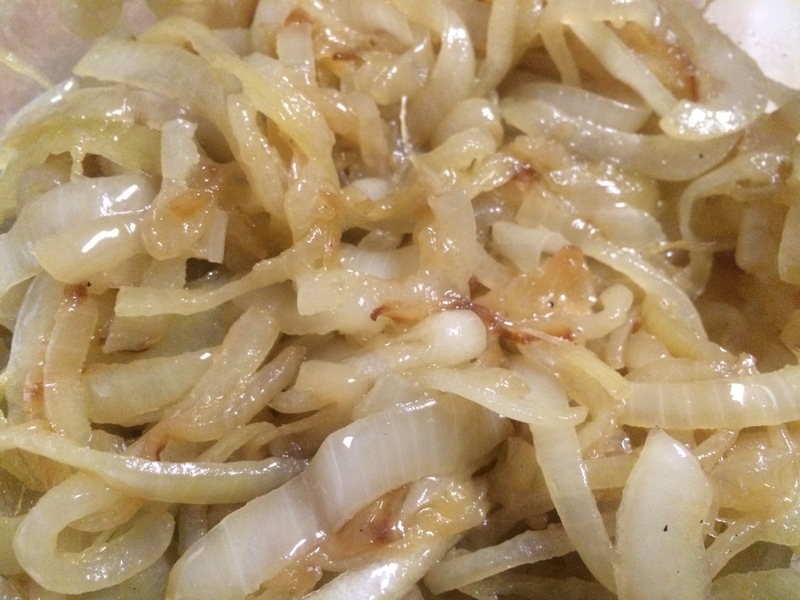 What’s there not to like about caramelized onions? 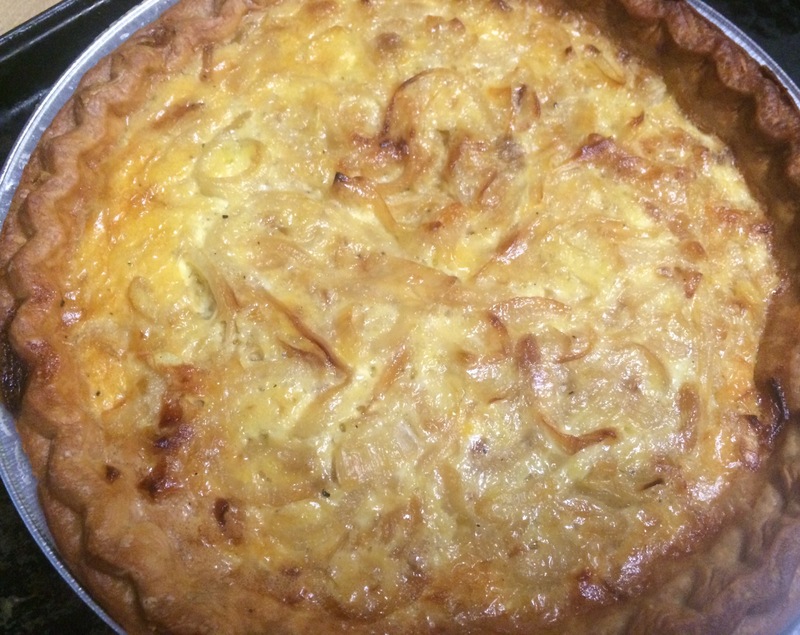 And really, what’s not to like about baking them into a tart, especially with Farmer Kim’s fresh eggs? We had larger pieces of tart for dinner last night and I had a small piece for breakfast this morning. It was a savory, tasty treat for both meals. My dad was a huge fan of onions; he would have loved this! Heat the oven to 475F. 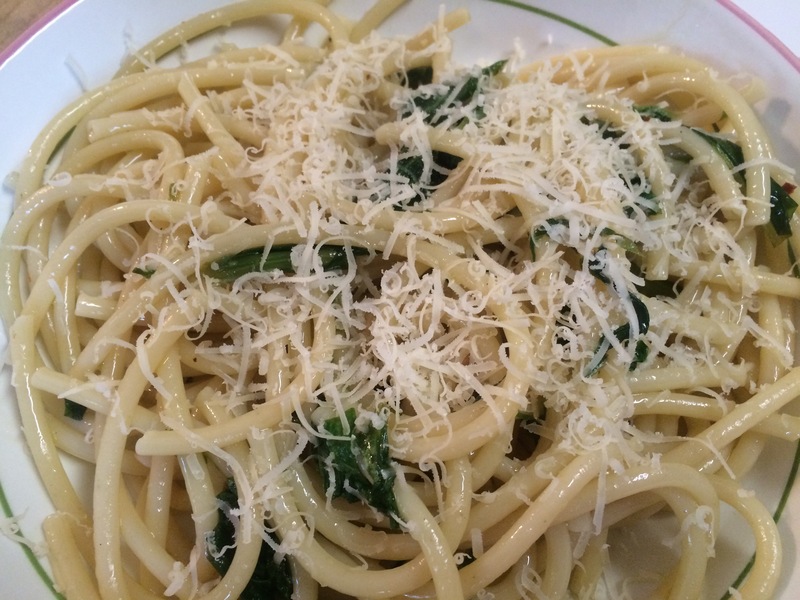 In a large skillet, heat the butter and olive oil over medium-low heat. 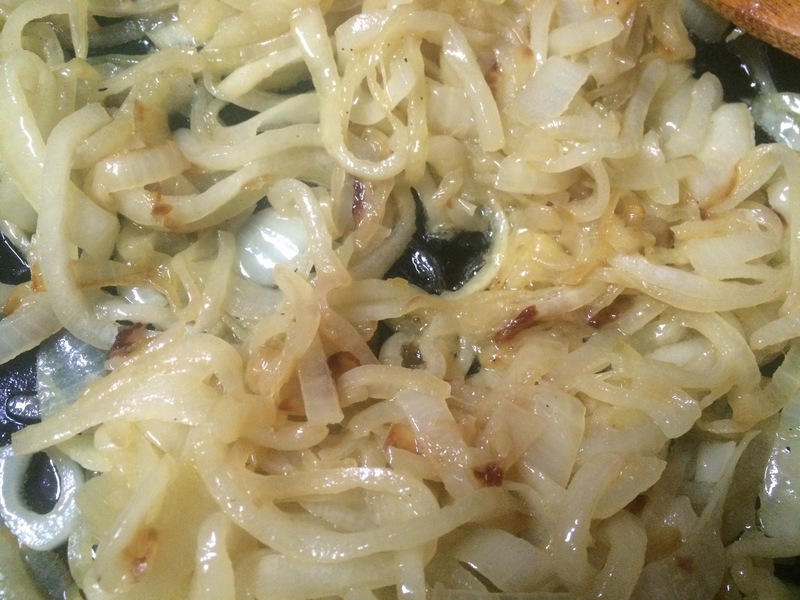 Add the onions and cook – stirring often, until they are lightly caramelized, about 35 minutes. Add the flour and cook for 5 minutes. Transfer to a medium-sized bowl and cool. In a large bowl, mix the eggs, cream, milk, salt and pepper. Add the onions and stir to combine. Pour the egg mixture into the crust. 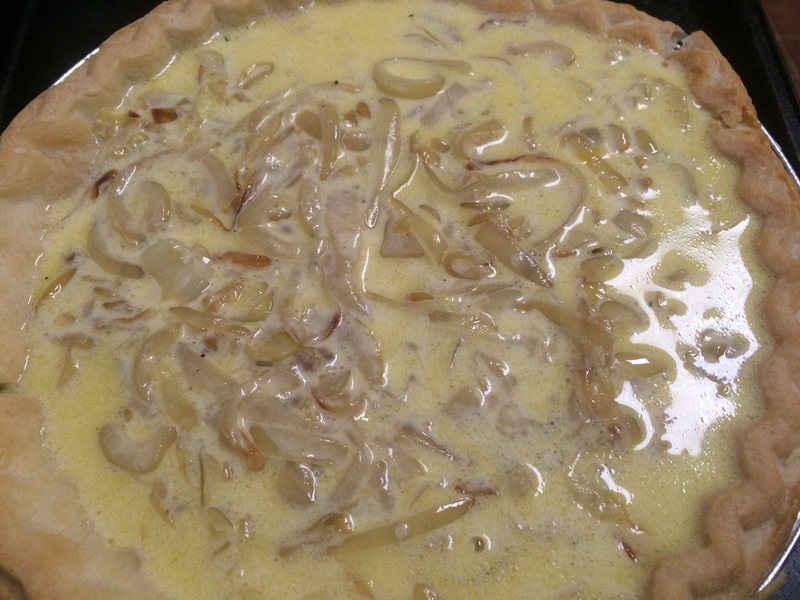 Place the tart on a baking sheet and bake for 10 minutes. Reduce the heat to 375F and bake until the filling is set and lightly browned, approximately 20 – 25 more minutes. I had not intended to write a post about making this bread. But once I made the filling, I realized how good this was going to be. So there are only a few pictures…but much enjoyment! 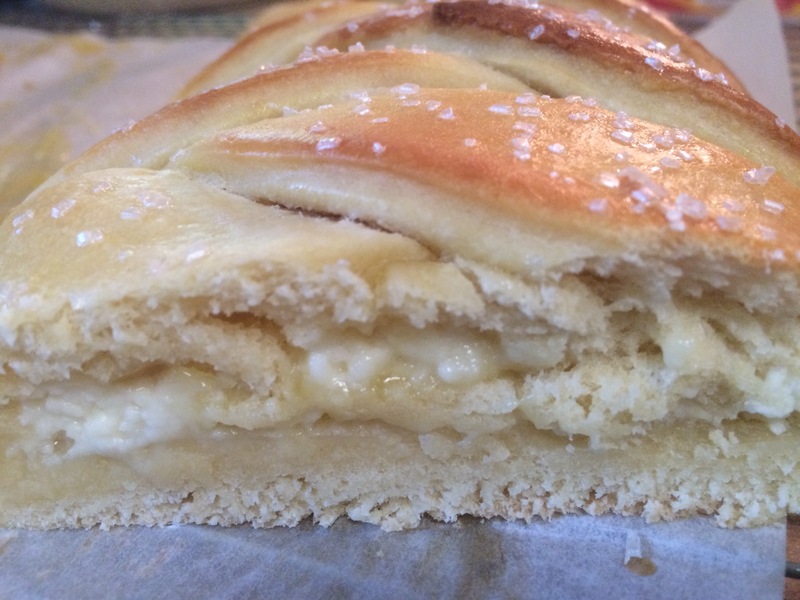 With lemon cream cheese and lemon curd fillings, this is basically a cross between a bread and a danish. Perfect for breakfast or dessert. And a good choice for Shavuot. So I froze one loaf that I will defrost for our enjoyment next month. In a small bowl, combine the sponge ingredients. Stir well to combine, loosely cover with plastic wrap, and set aside to proof for 10 to 15 minutes. In the bowl of a stand mixer combine the sponge, yogurt, butter, eggs, sugar, salt, and flavoring. Add 4 1/2 cups of flour and mix with the paddle attachment until the dough is a rough, shaggy mass. Switch to the dough hook and knead on speed 2 until a soft, smooth dough forms, about 5 to 6 minutes, adding more flour if needed to achieve the correct consistency. Place the kneaded dough in a lightly greased bowl, cover with plastic wrap, and allow to rise for 60 to 90 minutes, until quite puffy and nearly doubled. While the dough is rising, prepare the filling. Combine all the filling ingredients (except the lemon curd) in a small bowl, mixing until smooth. Reserve the filling and lemon curd until ready to fill the braids. Gently deflate the dough and divide it in half. Cover half with plastic wrap and set it aside as you roll out the first piece into a 10″ x 15″ rectangle. Rolling on parchment paper makes moving the bread to the baking sheet much, much easier. Lightly press two lines down the dough lengthwise, to divide it into 3 equal sections. Spread half the cream cheese filling down the center section, and top with half the lemon curd, leaving 1″ free on all sides of the filling. To form the mock braid, cut 1″ crosswise strips down the length of the outside sections, making sure you have the same number of strips down each side. 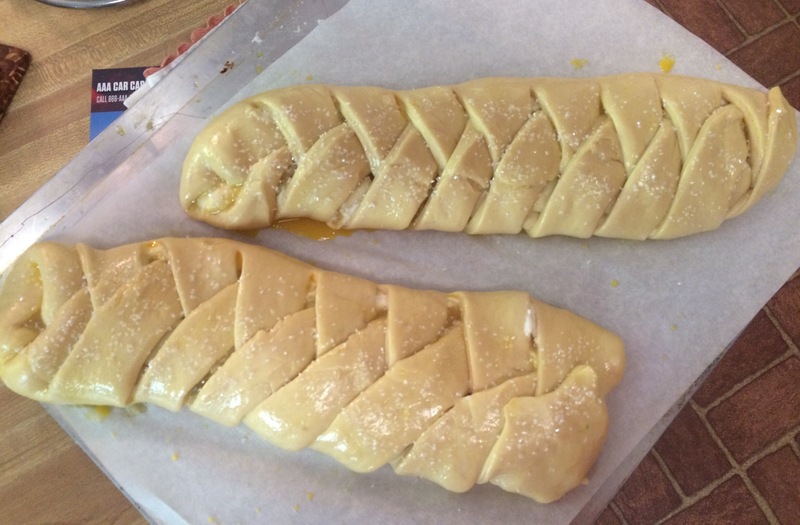 Beginning on the left, lift the top dough strip and gently bring it across the filling diagonally. Repeat on the other side with the top dough strip, so that the two strips crisscross each other. Continue down the entire braid, alternating strips to form the loaf. Repeat the rolling, filling, and braiding steps for the second piece of dough, using the remaining cream cheese filling and lemon curd. Set both loaves aside, lightly covered, to rise for 45 to 50 minutes, or until quite puffy. Preheat the oven to 375°F. Brush the loaves with egg wash (one lightly beaten egg, 2 teaspoons water and a pinch of salt), and sprinkle with coarse sparkling sugar, if desired. Bake for 25 to 30 minutes, or until the loaves are golden brown. Remove from the oven and cool for 15 to 20 minutes before serving. It has now been over a year since the start of my Challah Project. I have made challah nearly every week (of course not all were posted) and have learned better how to “read” my dough. I have learned that I like a fairly sticky dough before letting it go through it’s first rise. I have decided I do not like sourdough challah, although I love sourdough bread. 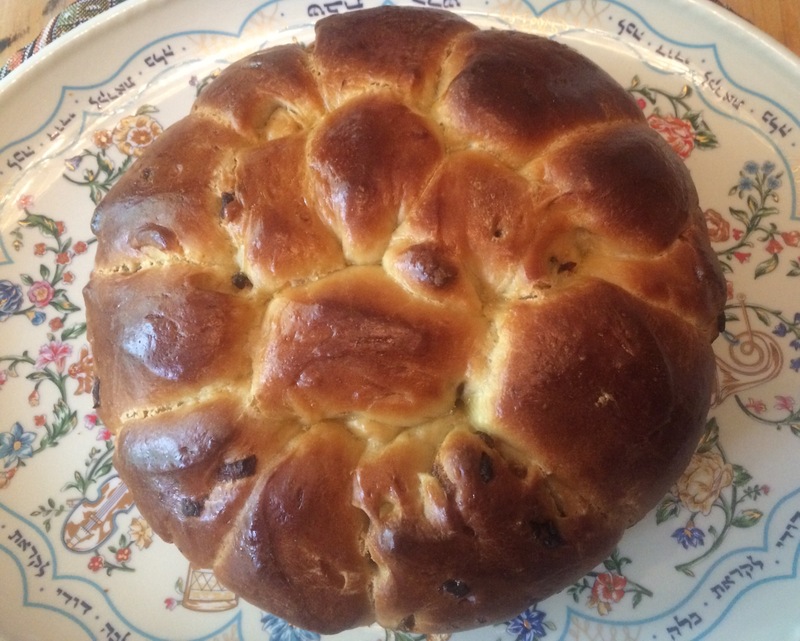 I love stuffed challahs – whether sweet or savory. My son prefers simpler challah, fluffy without much added to it; surprisingly, he does NOT like chocolate chip challah – unless it is french toast. Yes, we have learned that just about any challah works well as french toast, even if we were not thrilled with it as a challah by itself. I have more to learn, so the project will continue a bit longer, and will then morph into a project on Jewish breads in general. 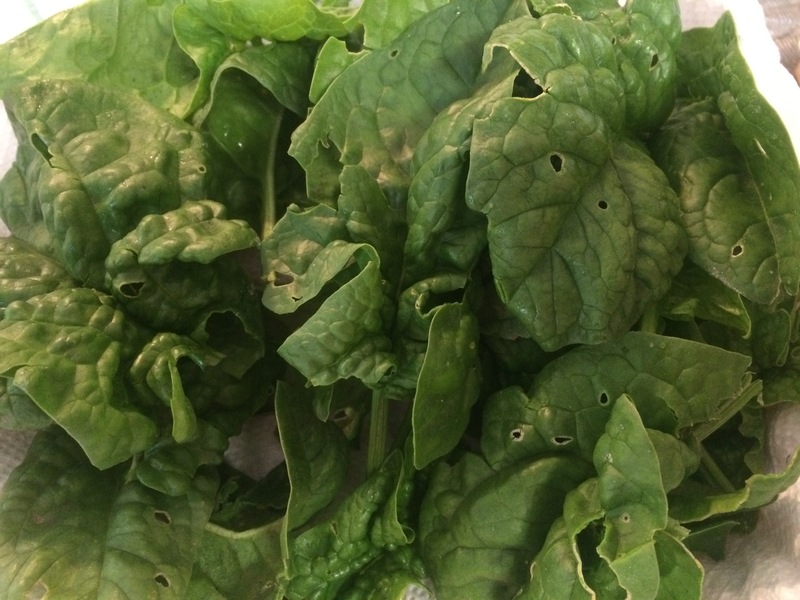 I am finally harvesting some spinach from the garden!! Spring must actually be here (even if the sun hasn’t made an appearance yet). It has been a frustrating spring. First, the groundhog came back and ate all the greens I planted (except spinach, he doesn’t like spinach). Then I put up a solar powered electric fence to keep him out, which it did, until we had about 10 days without sun and the battery died. So that day he devastated the garden again. But the sun peaked out enough to charge the battery and we were back on the following day. But it has been so cold and rainy, that all the plants are running a few weeks behind schedule. I planted some of my tomato seedlings, but something at their tops. And the rest of the seedlings are taking a long time to get big enough. And all the rain has, I think, rotted the seeds I planted. So it looks like I will be buying tomato zucchini and winter squash plants. At least my strawberries and snap peas are happy (they got established before the endless rains). Now, if I only get some sun, there will be strawberries! Preheat oven to 400 degrees F. Shred the potatoes using the food processor’s shredding blade. Place the potato in a bowl and cover with cold water. Let them sit for a few minutes while you prep the other ingredients. Beat the eggs with the water, salt and pepper until fluffy. Set aside. Place a cast iron skillet on the stove and heat over medium high heat. While heating, drain the potato in a colander, then place them in the middle of a clean tea towel. Squeeze the shreds in the tea towel to remove excess liquid. When the skillet is hot, pour 3 tbsp olive oil into it. It should be hot enough that you’ll see wisps of smoke coming from the surface. Immediately spread out the potato into the bottom of the skillet, forming an even layer of shreds along the bottom. The potato should sizzle. Cover the skillet with a lid (any pot lid that covers the top will do) . Let the potatoes cook for 5 minutes. Uncover the skillet. Spread out the chopped spinach evenly across the top of the potatoes in a single layer. 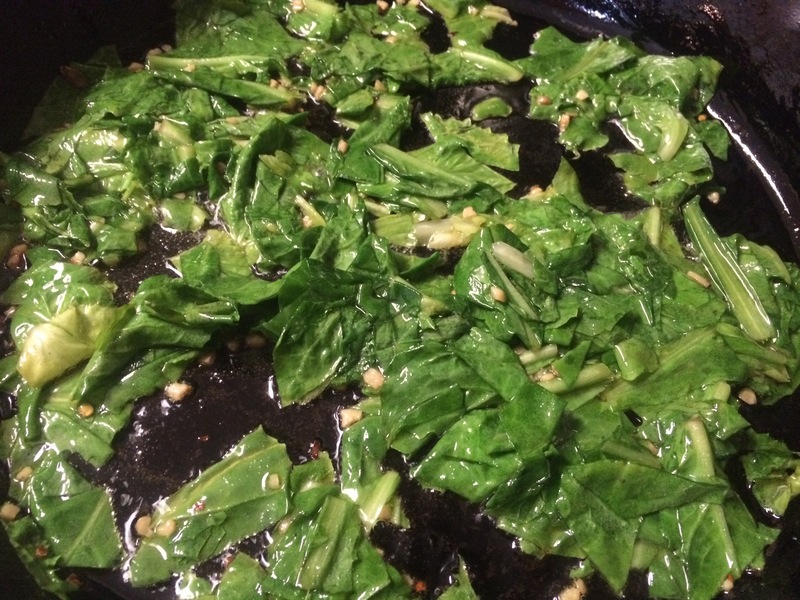 Recover the skillet for 1 minute longer until the spinach is slightly wilted. Uncover the skillet and sprinkle evenly with the crumbled cheese. 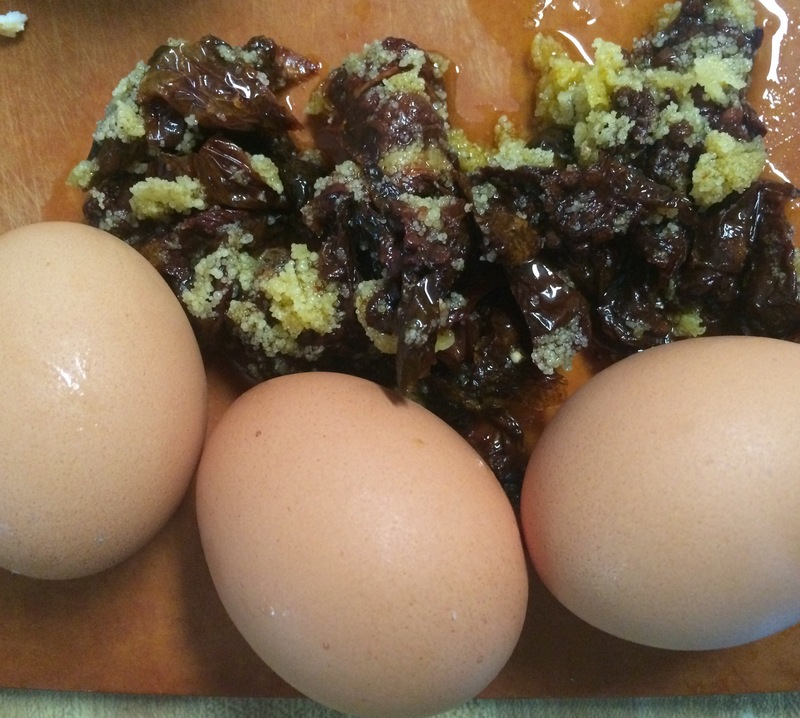 Re-beat the eggs, then pour evenly across the top of the cheese to cover. Place the skillet into the preheated oven and let it cook at 400 degrees for 10-12 minutes, or until a knife inserted in the center of the skillet comes out clean. Remove the frittata from the oven and let it cool for 5 minutes on the stovetop. Serve and enjoy! While I wait for my garden to start producing this year I still have sun-dried tomatoes from my garden and eggs from Farmer Kim. These tomatoes were in my fridge, so the oil has solidified a bit. That is fine, it will melt and be quite useful when the tomatoes are cooked. 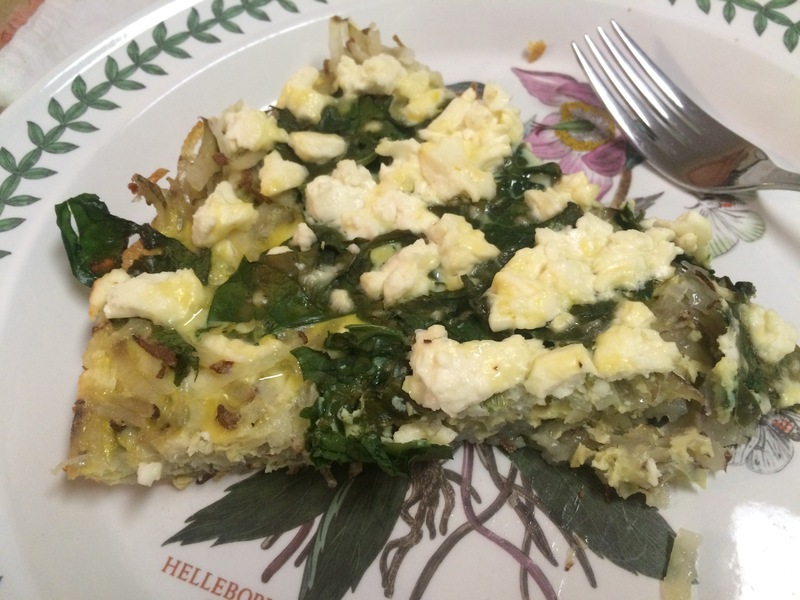 Perhaps a more fitting name for this is spanakopita quiche. 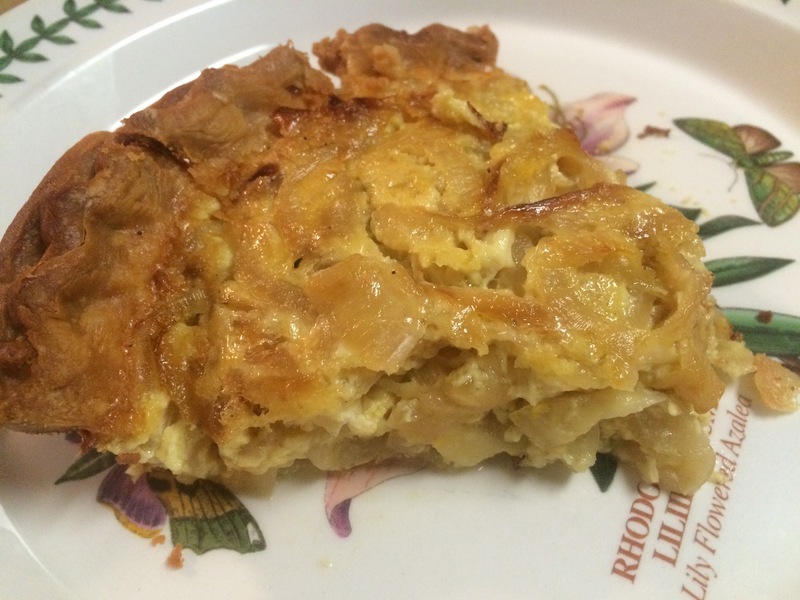 This tasted like a luxurious, creamy version of a spanakopita. 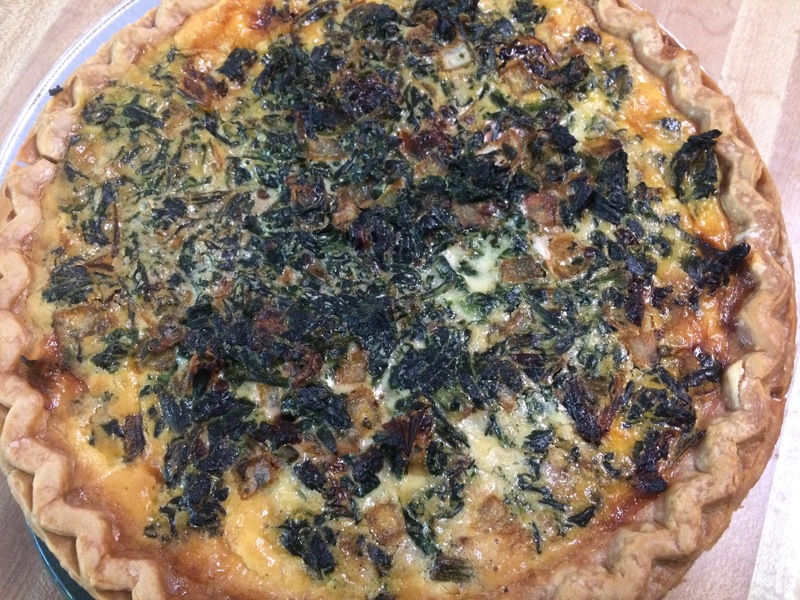 I live sun dried tomatoes, and the addition of them to this quiche was perfect. Every few bites you would find their flavor bursting in your mouth. Blind bake the pie crust, set aside to cool. Preheat oven to 375. 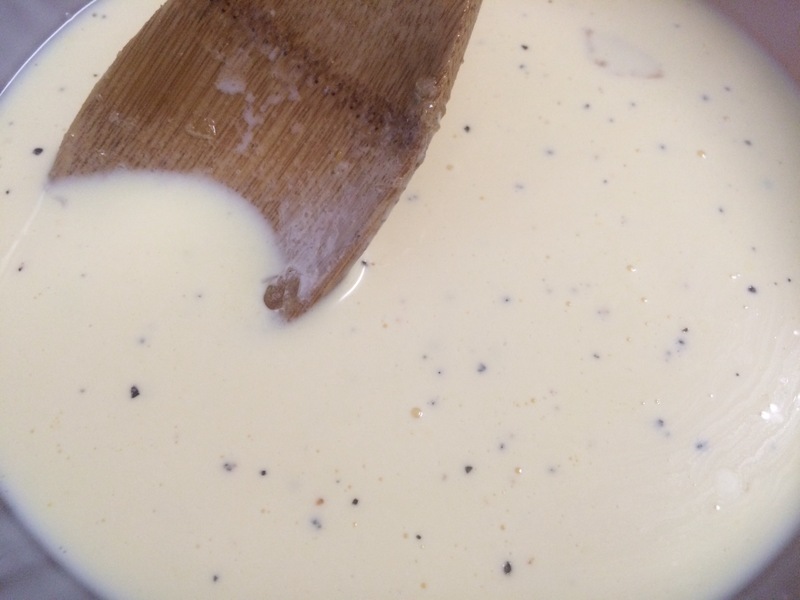 In a medium bowl, combine eggs, milk, cream, salt, and pepper, blending until smooth and well combined. Set aside. Over medium-high heat, saute onions and sun dried tomatoes (there should be enough oil from the tomatoes to help with the cooking process, but if not, add a little more). Cook until the onions are soft and translucent. 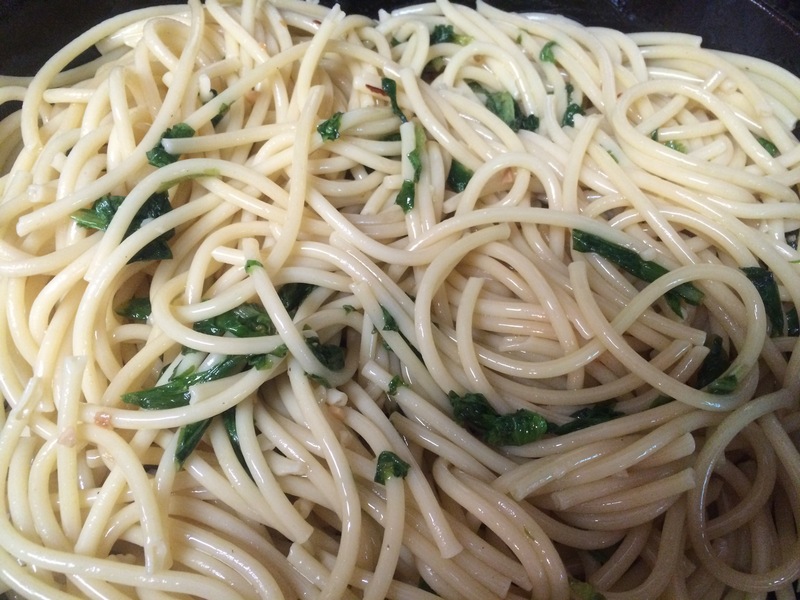 Add spinach and continue cooking until spinach is soft. Season lightly (depending on how salty your feta is). Remove from heat and set aside. When pie crust is done, cover bottom with crumbled feta cheese. Top with spinach mixture. Make sure the spinach and cheese evenly cover the bottom of the pie crust. They will float up during the baking process. Bake for about 20 minutes. Decrease oven temperature to 350 and continue baking for an additional 20-25 minutes (about 45 minutes total baking time), or until filling has set. If crust or top begins to brown too much, cover gently with foil. Cool slightly and serve warm. I was really looking forward to making this challah. 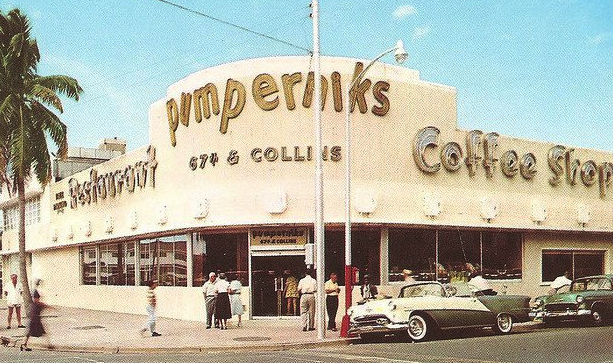 One of my strongest memories of my family’s trips to Florida were meals at Pumperniks and Wolfie’s and their amazing bread baskets. 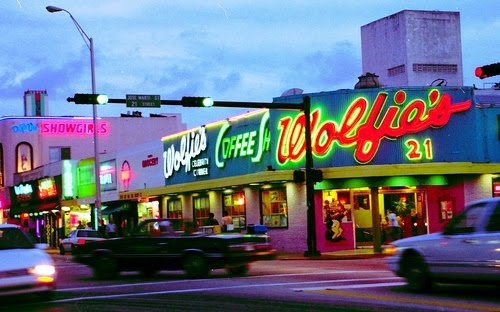 I had 2 favorites – the mini challah braids and the onion challah rolls. In a large bowl of a mixer, dissolve yeast in warm water. Add sugar and 11/2 cups flour. Allow to proof for 30 minutes. After yeast has proofed, with machine on with a dough hook attachment, add salt, oil, beaten eggs, and the rest of the flour one cup at a time. Keep mixer until dough forms a ball, then continue to mix for 5 minutes. Remove dough and place in a large oiled bowl in a warm place. Allow to rise about 1 1/2 hours. In the meantime, make the onions. In a large saute pan, heat oil over medium heat. Add onion. Allow to caramelize, stirring occasionally for about 30 minutes until golden and sweet. Punch down dough and then add the onions and mix in. Allow to sit for another 10 minutes then knead again and begin shaping. If you want to make a pull apart like the photo, use a round pan, grease and flour, place rolls all around and in the middle. Allow to rise another hour. Then brush with egg wash.
After many nights of heavy Passover foods, I was craving soup. Plus, I had stopped at one of our local orchards on my drive home from a client meeting and picked up some just-picked asparagus. 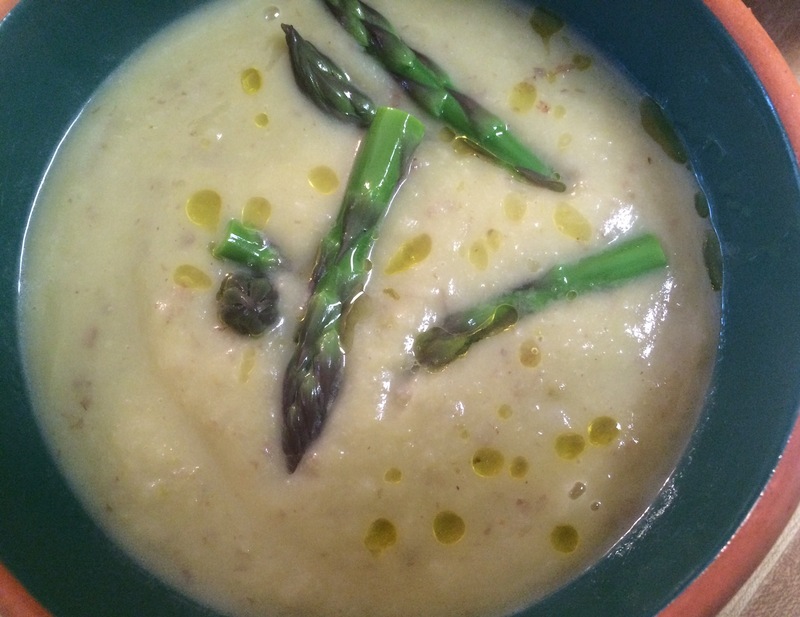 Asparagus and my Jerusalem artichokes…a happy combo! The soup looks rich and tastes rich, but is so light and healthy! Perfection! Slice off the tips of the asparagus about 1 – 1 1/2 inches long and reserve. Trim the woody ends and discard. Cut the remaining spears into 1″ pieces and set aside. In a large saucepan, heat the olive oil over medium heat. Add the shallots and salt. 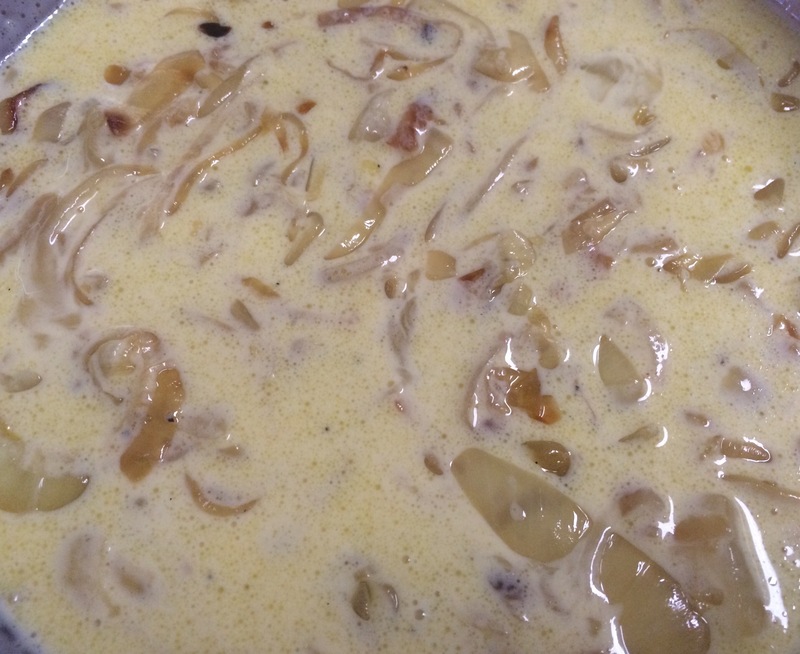 Cook until the shallots soften and become translucent – do not brown the shallots. Add the asparagus, potato and Jerusalem artichokes to the shallots. Add stock, cover and bring just to a boil. Turn down the heat to simmer and cook for 20 minutes until vegetables are tender. When the vegetables are tender, use an immersion blender and puree until smooth. Season as necessary with the kosher salt and pepper. To serve, ladle the soup into bowls and swirl a teaspoon of olive oil over each bowl. Divide the asparagus tips among the bowls and float them in the soup. Enjoy! 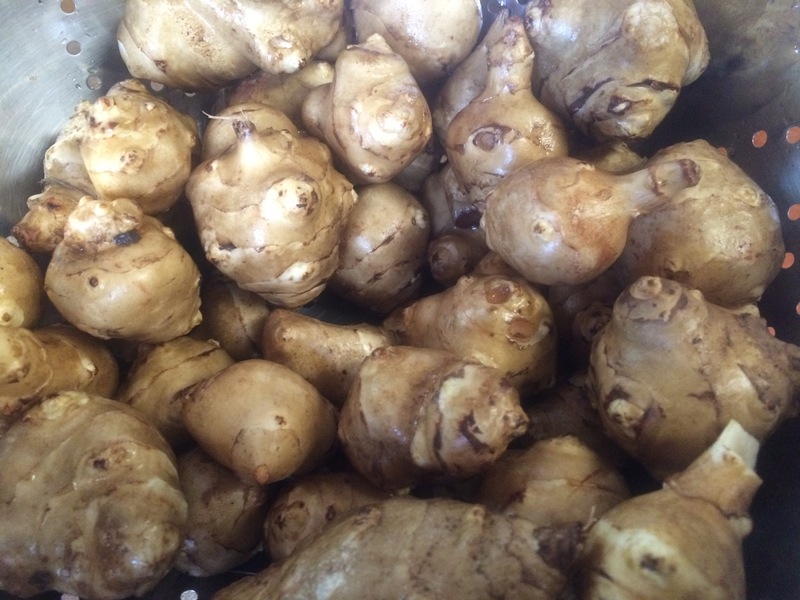 Although I did a lot of cooking and baking for our Passover Seder, only one ingredient came from my garden (other than my dried herbs) – my good ole Jerusalem artichokes. 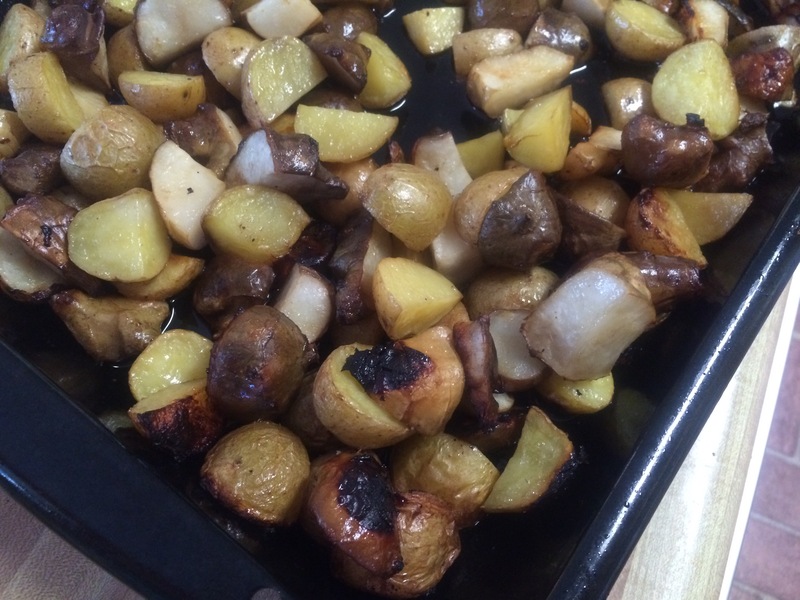 Roasted with some baby yukon potatoes and lemon, it made a really tasty side dish. I decided to go with roasted vegetables since I already was making a zucchini carrot kugel, so I did not need a second kugel. This is a large recipe, makes enough for 12, but you can scale it down easily. 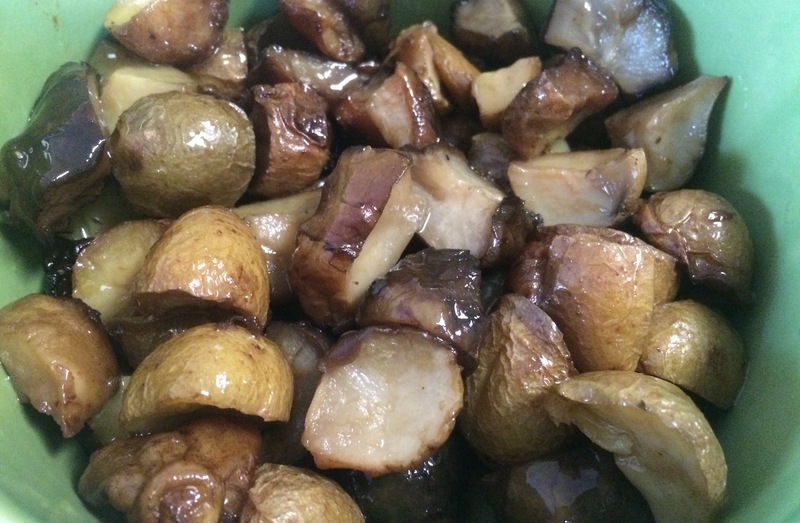 Steam the Jerusalem artichokes and potatoes for about 10 minutes until tender. While the roots are steaming heat the oven to 400F. Pour about 2 Tbsp of olive oil into each of 2 roasting pans and heat them in the oven. Drain the vegetables and divide between the two roasting pans. Cut the lemons in half and squeeze the juice over the veg then toss the vegetables to coat them the oil and lemon juice. Season with salt and pepper. Roast for about 40 minutes til golden and slightly crunchy (I like to cook them longer to get them really crisp).